The fractionation of carbon isotopes by marine phytoplankton is a function of the concentration of dissolved CO2 in seawater (Rau et al., 1989; Hinga et al., 1994). If surface waters can be assumed to be in exchange equilibrium between dissolved CO2 and atmospheric CO2, then the frac-tionation could be used as a measure of the level of atmospheric CO2. This observation has led to the suggestion that the difference between the 813C of coexisting organic matter and CaCO3 in sedimentary rocks might be a measure of ancient atmospheric CO2 concentration (Jasper and Hayes, 1990; Hollander and McKenzie, 1991; Freeman and Hayes, 1992). However, the organic matter in a sedimentary rock represents a mixture of phytoplankton-derived material, material that has been processed along the marine food chain and any terrestrially derived material added to the ocean by rivers. Because the 813C of these sources are different, determining S13C of the bulk organic matter would not reflect the value of the original photosynthate. To avoid this problem, a method has been developed for analyzing only organic compounds that are produced by and confined to phytoplankton. Using this method, ancient atmospheric CO2 levels have been deduced (Freeman and Hayes, 1992) and are plotted in figure 5.19. These results, as for the results of the paleosol and stomatal index methods, show a similar trend to that predicted by the GEOCARB III model, that of decreasing CO2 over the Me-sozoic and Cenozoic. Unfortunately, the plankton fractionation method is confronted with the problem that there are additional factors in the marine environment, other than CO2, that affect carbon isotope fractionation during photosynthesis. This introduces errors not shown by the error margins of the data in figure 5.19. Additional factors include plankton growth rate (Fry and Wainright, 1991) and cell geometry (Popp et al., 1998). Detailed experimental study of these effects has enabled Bidigare et al. (1997) to correct for these factors. These investigators found that growth rate is a direct function of the concentration of dissolved phosphate in sea-water. 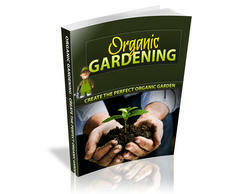 To normalize for constant growth rate, Pagani et al. (1999) applied the fractionation method to sediments that were deposited under oligotrophic conditions similar to those at present where the phosphate correction can be made. Pagani et al. obtained values for Miocene paleo-CO2 based on measurements of 813C of alkenones and carbonate microfossils, and results are shown in figure 5.20 in combination with the estimates of other methods for Tertiary CO2. Figure 5.19. 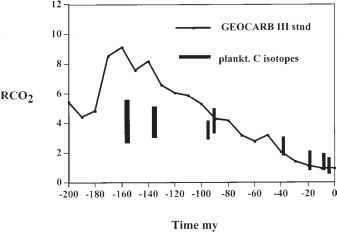 Comparison of results for RCO2 versus time based on the plankton carbon isotope method (Freeman and Hayes, 1992) with the standard GEOCARB III curve. Figure 5.20. Comparison of results for Tertiary RCO2 versus time. 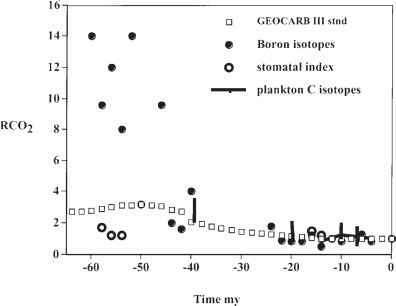 Boron isotope results from Pearrson and Palmer (1999, 2000); stomatal index results from Royer et al. (2001), van der Burgh (1993), and Kurschner (1997); plankton carbon isotope results from Freeman and Hayes (1992; vertical bars) and Pagani et al. (1999; curved bar). The succession of small unfilled boxes represents results for GEOCARB III modeling. to calculate the value of atmospheric CO2 concentration over Phanerozoic time (Rothman, 2002). However, as stated above, bulk organic matter represents a mixture of terrestrial and marine-derived material, and the calibrations based on the study of marine plankton do not apply generally to bulk material. Also, it has been shown that fractionation of carbon isotopes by plant-derived organic matter is not a simple function of CO2, but rather a strong function of atmospheric O2 (Beerling et al., 2002), which varies with time (see chapter 6). The intermixture of large amounts of terrestrially derived material with 813C values affected by variations in O2 is especially true of the Permo-Carboniferous, when a large proportion of global organic burial was derived from land plants (chapter 3). 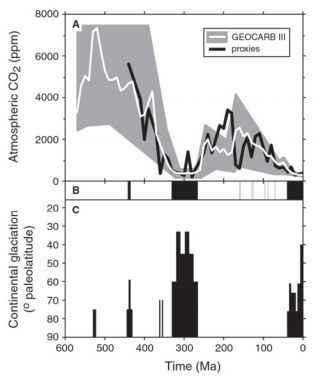 These considerations indicate that the simple use of A13C to derive CO2 values over the Phanerozoic (Rothman, 2002) is an inappropriate approach to the problem of deducing paleo-CO2.